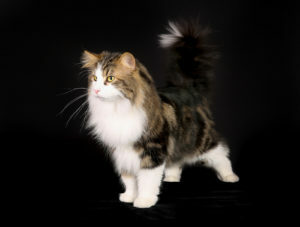 Are Norwegian Forest cats tolerant of dogs? Are NFC very tolerant of dogs? my Jarl Gra, NFC rescue that is 3 years old, is reasonably tolerant of my older dogs…. we got a puppy and he is still VERY tolerant of the puppy. is this normal for the breed? realize the 8 week old puppy is the same size as the NFC because he is an English Mastiff pup. Today the pup walked over to the cat laying on the floor and stepped on the cat’s tummy, the cat kind of gave him a look like “hey get off” with no noise or paw action….the pup left him alone…..
Charlie Phillips: They are generally very tolerant with dogs. A friend of mine had to stay at my house for a few months as hers was no longer suitable to live in. She had a German Shepherd who loves cats anyway. My wegie adored him as soon as he found out that he was a cat friendly dog. Carlos Myers: Not had much contact with dogs, but what we have had has been very friendly. Well, in front of people anyway. Our daughter brought her chocolate lab over for the first time when he was very young and, the one time he and Frankie were alone in a room, a yelp was heard and the puppy was a great deal more respectful after that. We also made sure they were never alone again! Any other meetings with other dogs has been fine and Gwen was certainly determined to be best friends with the lab at Christmas. Kyrie Ryan: I find it so confusing to read comments about traits when I don’t know which are about NFC and which are about DLH that look similar to NFC, but are called NFC. Janelle Roy: It does get confusing because many people on here seem to use the two terms interchangeably. Makes it harder to pin down traits that people post about being attributed to pedigree NFCs as opposed to DLH with an NFC look. Carlos Myers: Ella Sandoval: this is the same for our Frankie, who we got from a rescue shelter and who just kept growing. I call him our Nearwegian and we have now got a Norwegian kitten so that he can have a friend on equal terms by size . That was the intention, anyway, but I’m pretty sure Gwen has him under the paw already! Kyrie Ryan: When those same “markers” are so very common in DLH, it does not prove NFC ancestry. Proof of ancestry is the only absolute claim to NFC. Nash Turner: We have a Rhodesian Ridge back who tolerates the cats(3). Mr Pudge likes him though. Melody Waters: My boy Tor hates dogs, I don’t know why because no dog has being mean to him. The breeder I got him from even had dogs, so he had grown up with them for 12 weeks of his life. He had no fear of them and will take them on no problem. 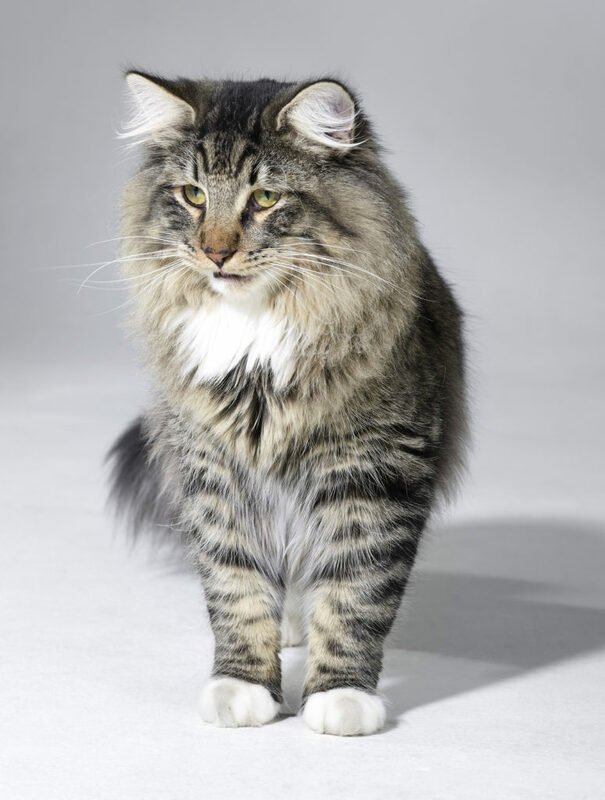 He has gone for a husky and a French bull mastiff at the vets once. Thank goodness both dogs didn’t attack him back and were friendly. My girl Anja won’t attack them but she also won’t give them the time of day. She just looks at them and walks off in a snobbish way. Melody Waters: Evan Ballard: it is hilarious. I do get embarrassed but thankfully the owners were understanding and thought it was just as funny. The dogs sure looked shocked. I’m just amazed that Tor has no fear. I think he thinks it’s a challenge if some sort. Melody Waters: Evan Ballard: I do believe that they are so like dogs and very clever. I’ve only tought Tor to sit before his treat, then he gets it, if I take to long he swats it out my hand! And Tor also does the petrol thing before bed, every window ledge is checked. Blakely Sparks: Our Pepe loves our two dogs (Mickey – 9 yo jack Russell x Staffy and Queenie – 6 yo Lab). We got pepe as a rescue cat just over a year ago as a kitten, he is 2 now. Pepe loves our dogs and they love him. Lots of game playing and snuggling. Never any scratching or biting, unless pepe is feeling adventurous and decides to bite Mickey’s ear or chew either dogs wagging tail. The dogs are very gentle with him. Phoenix Dunn: Bob (the cat) had been living with the dog for about 4 years ago they have settled into their routine very well. Every once in a while the cat has to remind the dog who’s boss! Related Post Oliver: My yorkie is terrified of the cats! 4lbs vs 22lbs….the cats know he is afraid of them so they “pat” him every chance they get. No claws, just pats….you can almost see them laughing!